Powers/Abilities: Freya possesses the conventional attributes of the Asgardian gods including superhuman strength (Class 25), stamina, longevity, vitality and resistance to harm. She also has several undefined powers mystical in nature that involves the rites of fertility and the growth of plants and living things. History: (Norse-German myth)- Freya is the daughter of the sea-god, Njord and Gaea in her as the earth-goddess Nertha. Exceedingly beautiful, she was once married to Lodur, brother of Odin, but he left her for reasons unknown to explore Midgard (the Earth). She took a mortal named Ottar to be her lover, but to prove his worthiness to be near her, she introduced him to the goddess Hyndla, and revealed to her that Ottar was a descendant of the great German hero, Sigurd. Freya, however, loved gold and had dwarves create her many treasures such as the necklace Brisingamen. To pay for their services, she gave herself to their father, Iwaldi, many times and had several daughters, among them Nanna, wife of Balder, Idunn, wife of Bragi, and Sigyn, wife of Loki. The dwarves also reputedly created for her Hildisvini, a great boar of solid gold whom she rode to show her way through the dark, who was very much like Gullinbursti, her brother’s mount. Loki, meanwhile, heard about her indiscretions and told Odin who requested that he bring to him Freya and her Brisingamen. Loki meanwhile absconded with the necklace rather than bring it to Odin. When Freya reported its theft, Odin told her he could retrieve it only after she spent a certain time in servitude to him as one of his Valkyries claiming the souls of the slain. As the Valkyrie Gondul, Freya delivered the spirits of dead heroes to Valhalla as a part of her penance and Odin then sent Heimdall to retrieve Loki with the stolen necklace. After serving her penance, Freya retired to her home Sessrumnir outside Asgard. (Marvel Super-Heroes III#15/3)- After the giant Thrym stole Thor's hammer, he demanded that the Asgardians wed Freya to him for its return. However, Freya refused to be bartered away, and Thor was forced to dress himself in Freya's clothes in order to trick the giants. (Thor I#321 (fb)) - In the modern era, a shapechanger (Rimthursar, who also used the alias of Farbauti) took on the form of a hawk, and in the Land of the Dwarves, found Freya (specifically named, but also described as a "waterfall maiden"). Rimthursar told Freya that Odin had died. This caused Freya to weep tears of gold. Changing to his true form, Rimthursar offered to dry Freya's eyes, pocketing the golden droplets for his own later use. Rimthursar then used the tears to create his Menagerie of humanoid beasts. Comments: Adapted by Bill Mantlo and Don Heck. 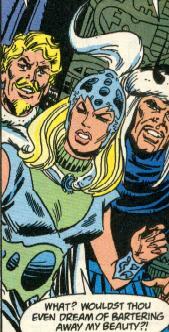 In the minor entry for Idunn under the Asgardians profile of the Official Handbook of the Marvel Universe#1, Freya seems to have been mistakenly confused with her daughter, Idunn. Mythologically, this is incorrect. Freya supposedly died during the Ragnarok in Thor II#85. Freya's Cloak of Golden Feathers has the power to transform its wearer into a falcon. 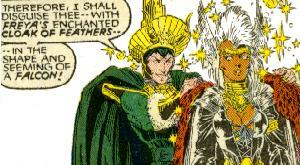 It was used by Loki to disguise Storm as a falcon so that the inhabitants of Asgard would not suspect that he had placed her under his spell.